Benedict Jacka’s Alex Verus, an unaffiliated mage whose magic specialty is divination, has an established backstory of his former apprenticeship to a particularly nasty Dark mage that he broke away from after a particularly dark period in his life. 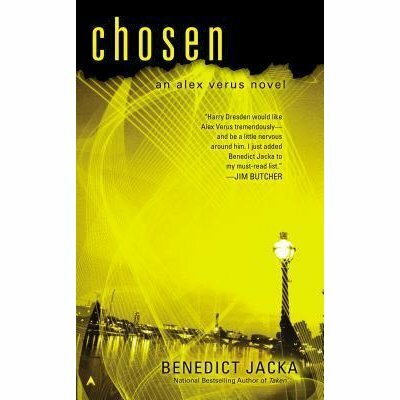 The fourth book in the series, Chosen, has that past come back to haunt him. SPOILER-FREE review after the cut. Alex’s backstory has been there for quite some time. He was one of four young people who were apprenticed to a dark mage named Richard. Richard has been gone for quite some time, but of those four, two are dead. One, Tobruk, had come after Alex and Alex had to deal with him. Another, Shireen, talked to him, went back to Richard’s house, and was never seen again. The third grew up to become a powerful dark mage herself who insists on calling herself Deleo. Address her by her original name at your own risk. In this book, Alex comes face to face with a group of adept vigilantes taking it upon themselves to bring down as many Dark mages as they can. Alex isn’t a Dark mage, but the group’s leader claims Alex is responsible for the death of his sister. Jacka’s series takes some big steps here. The source of Deleo’s insanity, as well as the exact fate of Shireen, what Alex did when he was in Richard’s house, and why he left are all brought to light, with differing reactions from Alex’s various young friends coming out. Jacka’s always been good about stressing that Light mages aren’t necessarily good and Dark mages aren’t necessarily evil. Deleo’s partner Cinder, for example, has a respectful working relationship with Alex at this point. The Light Council, meanwhile, won’t intervene if they don’t see the need. Most importantly going forward, readers learn what the heck happened to Richard. That is surely being set up for future books. Alex here has to figure out what kind of person he is, as nothing he says or does seems to put off the vigilantes, and Deleo has more reasons to want him dead. Each of Jacka’s novels improves on the one before it. I’m giving this one eight and a half adept vigilantes out of ten.